If you have a lamp with a loose socket that causes the lamp to flicker, to be difficult to turn on, or to just flat out refuse to light, you can replace the socket and give the lamp a new life. You can replace a socket so easily that, even if it’s not your favorite lamp, you may want to fix it and give it to someone else, like your nosy neighbor. You can purchase replacement lamp parts at any hardware store or home center. These parts are standard; you can buy lamp cord by the foot, and you can use just about any type of plug to replace the one on your old lamp. You can find several varieties of lamp socket switches. You control some by pushing a short shaft on the side of the switch, others by turning a knob, and still others with a pull chain. You also need to consider whether your present lamp has a three-way bulb in it. If you could turn the lamp on to several degrees of brightness, be sure to purchase a socket switch that’s designed to control a three-way bulb. You can probably get the right replacement parts most easily by taking the lamp apart (according to the following directions) and bringing the bad parts to the store so that you can find matching replacements. Remove the shade, bulb, and harp (the wired shape that holds the shade). Snap off the socket shell from the socket shell cap. Most sockets have the word Press stamped in two places on the shell. Squeeze the shell at those points and pull up to remove it. 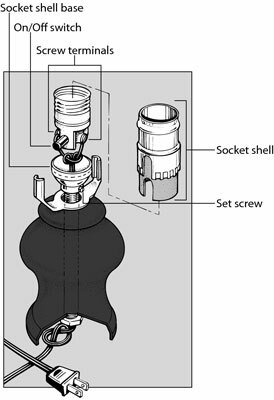 If the shell doesn’t budge, push the end of a screwdriver between the base of the socket and the side of the shell and then pull the shell up and off the socket base. Pull the socket switch up out of the shell base to expose enough of the switch to reveal the two wires attached to it. If the screws are loose, tighten them and reassemble the lamp. Loose screws may have been the lamp’s only problem. If the lamp works after you tighten up the screws, great! If not, take it apart again and proceed with the following steps. A lamp switch has a brass screw to which the hot (black) wire is attached and a silver screw to which the neutral (white) wire is attached. Lamp cords, however, don’t have colored wires in them. So, before you remove the wires from the old switch, note which color screw each wire is connected to. Loosen the socket cap set screw and then unscrew and discard it along with the old socket shell and socket. Screw the wire leads to the new socket. Place the new socket shell over the socket and push the cover down until it snaps into the new socket shell cap. Replace the harp, light bulb, and shade.